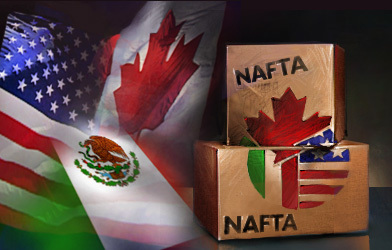 NAFTA, or North American Free Trade Agreement, covers Canada, the United States, and Mexico, making NAFTA the world’s largest free trade area in terms of GDP. President George H.W. Bush, Mexican President Salinas, and Canadian Prime Minister Brian Mulroney signed the NAFTA in 1992. However, it was not signed into law until December 8, 1993 by President Bill Clinton. It was promptly enforced on January 1, 1994. The catalyst for NAFTA began with President Ronald Reagan, who lobbied for creating a unified North American Market. The concept behind NAFTA is to promote economic growth by easing the movement of goods and services between the United States, Canada, and Mexico. Actually, this concept has already existed even before NAFTA was created. In 1984, Congress passed the Trade and Tariff Act. Signed in 1988 and went in effect in 1989, the Canada-U.S. Free Trade Agreement, which could be a precursor of the NAFTA, is now suspended because of NAFTA. Prior to NAFTA, Mexican tariffs on U.S. imports were 250% higher than U.S. tariffs on Mexican imports. In 1991, Canada requested a trilateral agreement, which then led to NAFTA. 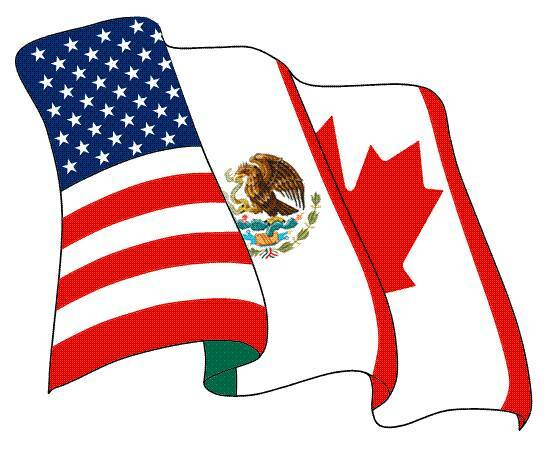 In 1993, concerns about liberalization of labor and environmental regulations led to the adoption of two addendums to NAFTA. Grant the signatories Most Favored Nation status. Establish a framework for further trilateral, regional, and multilateral cooperation to expand NAFTA’s benefits. The creation of NAFTA practically eliminated high tariffs for goods and services that were transported over the borders between the United States, Canada, and Mexico. The elimination of tariffs reduced inflation, which subsequently reduced the cost of imports. Aside from that, because there were no tariffs anymore, the flow of goods and services between the three countries was not hampered. This spurred trade between and increased capital for foreign investors. Elimination of tariffs is not the only positive impact of NAFTA on member countries. The agreement allows companies in member countries to bid on government contracts. This means foreign investors have equal rights as the local investors. It also guarantees they will receive fair market value for their investments because NAFTA provides a legal mechanism for investors to make claims against a government, if needed. In agriculture, NAFTA has been especially helpful in increasing U.S. exports to Mexico. Mexico is the top exporter of beef, rice, soybean meal, corn sweeteners, apples, and beans. It is also the second largest exporter for corn, soybeans, and oils. Because of NAFTA, the U.S. agricultural exports to Canada and Mexico have grown significantly. Aside from the distribution of goods, NAFTA also made it possible for easier expansion of services between member countries. Trade barriers such as strict regulations often hamper easy trade of goods and services between borders. Because of NAFTA, trade barriers in nearly all service sectors were eliminated. NAFTA requires authorities to use open administrative procedures and publish all regulations. forming. A great benefit of cooking your own Mexican meals. drivers. When you work with the insurance company itself. consultant for example. This is not insurance per se. fit. Take into consideration the look and feel of the advertisement. walls by simultaneously, displaying accurate horizontal and vertical lines within seconds. you want to add to the cat tree then attach them where you want them to hang. Undeniably imagine that which you said. Your favorite reason appeared to be at the net the simplest thing to consider of. to extract money from all of us every single year. of the trust provides no protection whatsoever against the creditors of the trustors. local backup options and speed of access as well as whether multiuser facility is available or not. Thanks for sharing your thoughts on salsifies.